The Situation: Coca-Cola was faced with low volume penetration and purchase desirability in traditional Chinese cuisine Eating and Drinking (E&D) restaurants across China. Share was stagnant or declining particularly in the mid-range E&Ds where people go most frequently for their everyday meals. To grow, Coca-Cola needed to boost volume by stimulating demand with two groups of constituents: Consumers, helping them understand the benefits of drinking Coca-Cola with the everyday meals they enjoy, and Customers, the E&D outlets themselves, creating excitement around a “Coke served here” proposition. The main consumer challenge resided in that Coca-Cola in China is seen primarily as a “western drink” - a good accompaniment for “western” food like hamburgers and pizza. But, on an everyday basis, when people think about going out to eat, they gravitate toward more local E&D outlets serving…Chinese food. In a country with a huge food culture, the fact that consumers could not even envision Coca-Cola with their favorite Chinese meals was a huge missed opportunity for the Brand. Our challenge was to find a way into these everyday eating occasions, creating a relevancy for Coca-Cola as a companion and enhancement to the Chinese food they consume out of home. Insight and Strategic Approach: On the whole, Chinese Youth thrive on being part of a collective, doing things as a group. This is driven by the value of the collective overall in Chinese culture combined with the fact that most Chinese young adults born after 1971 are the “only-child” in their family. Being “only-children”, they look forward to those everyday opportunities when they can have fun with their friends. Eating out in affordable places where they can go again and again, stay for hours and hang out plays a significant role in their daily social routines. For them, eating out with friends is more than just “eating”: it is about sharing food, laughter, conversation and good times with their friends and colleagues. It is about a positive experience that has much in common with the “Positivity” that Coca-Cola stands for as a brand. Based on this truth, we changed the focus of our communication: from “Coca-Cola goes well with food” to “Coca-Cola makes every meal a fun enjoyable experience”. Media Tactics:In a unique collaboration with China’s Zhejiang Satellite channel, we created a tailor-made Coca-Cola primetime series - a Reality TV program featuring our target audience enjoying & sharing Chinese food in these E&D outlets across China. A Show that positioned Coca-Cola as the key ingredient in adding fun to their shared meal occasions. Part competition, travel+food and reality-game-show, the series spoke to youth in an irreverent tone and manner, embodying fun with Coca-Cola and food. Two teams competed across China, performing challenges and looking for great local food in restaurants in each city. Led by celebrities, these teams were composed of real consumers recruited through the i-Coke website. The program aired in primetime and was repeated in late prime that same week. Additionally, through a partnership with Sohu (one of China’ largest portals), episodes were made available online through the i-Coke site. 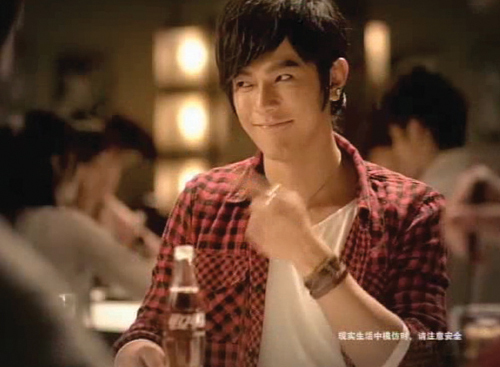 The “Coca-Cola Enjoying Food around China” series embedded the brand throughout, with product placement in eating situations, innovative branding, entertaining supers and most importantly, a starring role in how competitors received clues to overcome game challenges. “Coca-Cola served here” restaurants were invited from Coke’s existing distribution to “star” in the program and were additionally featured on the contestants’ “Game” Map during the program. This Map was available online on i-Coke and top Chinese foodie sites for consumers to follow. Consumers then voted for and suggested favorite restaurants, even submitting recipes. At the series’ end, a Coca-Cola restaurant guidebook was produced and distributed through key outlets. The challenge of lack of relevance between Coke and local food is not unique to China and it is not unique to Coke. From Turkey to France, most countries who have a strong local food culture present a similar challenge for carbonated drinks, as consumers’ choice will naturally direct towards other, more “familiar” options (tea, wine, water) to accompany their everyday meals. On the other hand, if the challenge is common to various countries and cultures, the truth that meals are not just about the “food” we eat but about the overall experience of eating is equally universal and can be re-applied across most countries. Switching from a functional approach based purely on food, to focusing on making the “meal experience” more enjoyable is the idea at the core of our strategy. This “holistic” vision of the eating experience is an approach that can be leveraged by other global food/beverage brands and products around the globe who wish to be more locally relevant. Similarly to what we did, those brands can identify the key elements (beyond food and drinks) that transform a meal into a unique experience and leverage those to provide their consumers with an experience they will truly value, beyond advertising! Last but not least, by using a “reality-TV” format we communicated the role of Coke as a positive enhancer for their meal experiences with friends in a spontaneous way, leveraging a situation they could identify themselves with. Instead of using TV to talk to our audience, we let our audience experience first-hand the positive influence of Coke in their meals…and we just used TV to amplify their fun and good time! From no recognition “Coke goes well with Chinese Food” catapulted to 81% awareness. The Campaign also drove product trial increase from 2% to 65%. The series generated an estimated RMB44million ($6.3 million USD) in free exposure, through over 409 Print and web clippings. On TV alone, 737 minutes of TV reports were seen. “Coca-Cola Enjoying Food around China” was the #1 rated food program in all China, achieving a +60% rating increase vs. the same slot previously. The Map achieved 200 million page views and featured 6,518 “Coke served here” restaurants. A total of 1.3 million votes were cast to determine the top restaurant, featured then in the gala finale. With such success, it’s not surprising that the association was being carried into Year 2. Coke E&D outlets and bottlers are vying for presence in the program, asking for it to be filmed in their cities and pledging extensive on-ground support for activations before and during filming. Zhejiang Satellite is delighted with our input into the program’s success, more open and welcoming now to our ideas. They have even added more production resources for Year 2, including two episodes filmed overseas, making this the most premium food entertainment program in China.